Are you a retailer or looking to buy in bulk? Visit our retailers page! Buy the best-selling game on Amazon! Learn chemistry and have fun! Free delivery with Amazon Prime! Two games for $50.00 with FREE shipping! Three games for $70.00 with FREE shipping! Four games for $85.00 with FREE shipping! Eight games for $160.00 with FREE shipping! International Customers! For $45.00 we'll send the game anywhere! 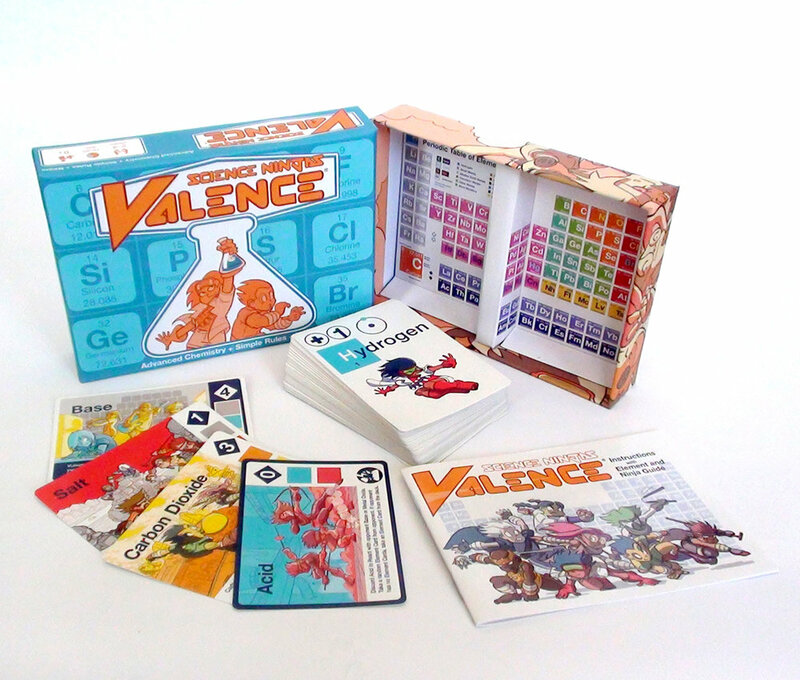 The brainchild of two PhD's in chemical engineering along with a New York Times best-selling cartoonist on a mission to stimulate scientific curiosity, Valence packs a powerful understanding of chemistry into an addictively good-natured game that will hit the spot for kids ages 8-12. Learn the surprisingly simple rules here! "Playing the game definitely helped with the students' abilities and enthusiasm for chemistry." "Games are usually either boring and instructive or violent and fun. This one is lots of fun (hence kids flocking around the table the whole time!!!) and you learn cool stuff." "As I was putting Carolina to bed she was telling me how much she loved the game and she was so bummed that she would have to wait so long to buy it...ha ha, it was a hit!"